I can't blow dry my hair to save my life. At least not with a round brush and conventional blow dryer. Unlike my other Asian sisters, I was not blessed with naturally frizz-free, stick straight hair. When left to its own devices, my hair air dries into a dull, frizzy, and slightly wavy pouf of a mess. I have natural volume but not the good kind. I long for the ability to execute a smooth, bouncy, and flip-worth blow out at home. You know, the swing-your-chair-around-and-gasp *magic* moment. But a $40 not-including tip blow out weekly is not in my cards. So I invested hours into YouTube tutorials and made countless attempts. These trials turned into twice weekly "arms-day" workouts. They consisted of stretching my arms high in various unnatural positions, flipping, angling, twisting my wrists awkwardly to create tension and holding a hair dryer for over a half hour. Despite my efforts and opening my wallet for the "best tools", I still ended up with an overheated, rough head of hair and fly-aways galore. Not Instagram-worthy. Not worth the 45 minutes effort. Did I even try? This was a frustrating experience as I knew my hair had the potential as my hair stylist had executed multiple times. I started to research rotating brush dryers a few months ago. My hope was that if I reduce the manual effort and allowed the dryer brush do the smoothing with mechanical rotations, it would lead to better results. So I ordered the BaByliss Pro Nano and Conair Infiniti Pro. Both these tools had similar construction and touted similar results - pretty much the same tool. Not surprisingly they both resulted in more voluminous hair. However, I was still not able to achieve the smooth, frizz-free look that I desired. I test both tools with my hair approximately 80% to 90% (air) dried. The main challenge with these tools was using them on my long hair. Smooth and bouncy hair requires the application of tension. So I still had to stretch my arms high and out to position the dryer for optimal tension but now with the added challenge of a rotating brush. Getting the bristles to catch my hair ends and then rotate neatly towards my head was more work than it was worth. It took some time to figure out the optimal motions. In doing so, the rotating function felt more troublesome than anything else. The secondary problem was the inability to dry hair near my roots. These tools are more styling tools than dryers, so the air flow is rather mild even on the high setting. Holding the tool close to my scalp for an extended period of time became tedious. Also, the rather large rounded brush shapes were also not optimal given the amount of air flow. I ended up returning both tools. The BaByliss Pro Nano and Conair Infiniti Pro weren't ideal for me but may be good options for those with shoulder-length or shorter hair. I eventually stumbled upon and fell in love with Revlon One Step Volumizer Hair Dryer. At first look, this Revlon tool doesn't appear to be significantly different from the BaByliss or Conair option. But it is. Because it is a true hair dryer and emits a powerful flow of hot air. This makes all the difference in achieving a beautiful and smooth blow out. It finishes drying fast and minimizes risk of heat damage (I still partially air dry). The unique oval-shape makes it part paddle brush, part round brush. I can blow my main hair shafts straight and achieve curled ends. I found zero issues rotating the brush from end to root, and creating a lot of volume. The brush head is an adequate size and shape to get in between layers of hair and dry at the roots completely. 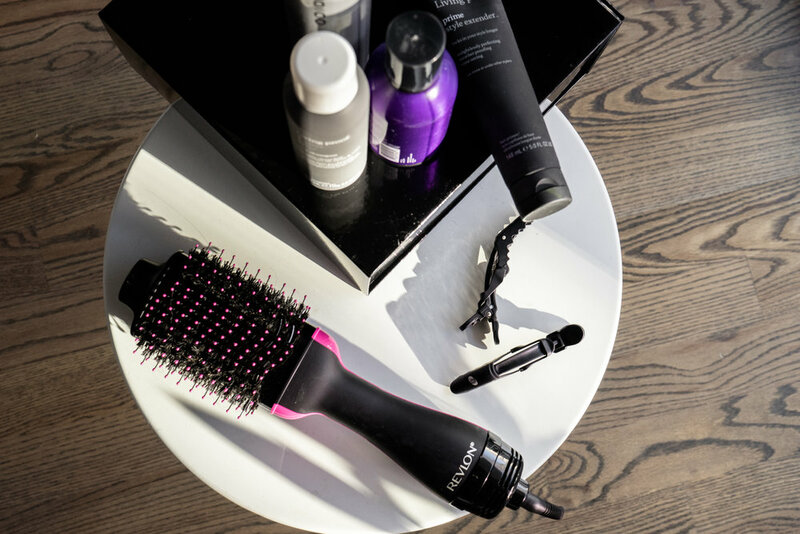 The mix of nylon pin bristles and tufted boar bristles means it detangles hair and smooths to a shine. The brush is also ceramic-coated for even heat distribution and reduces over-drying. Per the packaging, the dryer uses ionic technology and emits negative ions to reduce static and frizz. This Revlon tool does not rotate. You have to manually maneuver the tool like a conventional round brush. I prefer the simplicity. I found it easier to work with defined sections of hair to build body and create smoothness. As opposed to the previously mentioned rotating brush tools that would often catch onto and become tangled with sections of hair not being worked on. The plastic tip of this tool is cool to the touch so you can use your free hand to guide and create tension. There are three heat settings: low, high, and cool. I find that the low setting is more than enough heat and speed to dry my hair. Switching to the cool setting is easy but it does take a little while for the actual brush to blow cool air. It has a swivel cord so switching hands or directions is a breeze. The cord is approximately 5 1/2 feet long. It weights as much as a typical hair dryer. It feels slightly bulky in my hand. The motor for the dryer is housed in the handle. It's the only place for it and considering the drying power, the slight bulk is a minor trade-off. I'm not a fan of the black and hot pink color combination. This is only option offered right now. I would love a classier look. This technically isn't a con yet - but I'm wondering how this tool will perform when the pink tips of the nylon bristles wear off. Will it still detangle seamlessly? I've only been using this dryer for a month so only time will tell. The Revlon One Step Volumizer gives me all the results that I want. My hair is bouncy, shiny, and (mostly) frizz-free. I still have some fly-away baby hair and I always have some dryness on my ends (genetics) but I can live with that. It has great movement and overall, my hair looks healthy. This dryer cuts my drying and styling time down by more than half. Now I only spend 15 to 20 minutes with my hair. This is now my #1 favorite hair tool. I recommend this dryer brush to anyone who loves great hair without too much fuss.